Killer Sudoku Pro ups the ante on regular Killer Sudoku by adding subtraction, multiplication and division to the puzzle. So, like Killer Sudoku, Killer Sudoku Pro puzzles includes all of the rules of regular Sudoku but adds in dashed-line 'cages' which must result in given values when a particular operation is applied. Killer Sudoku Pro is also sometimes known as Killer Pro or KenDoku™. 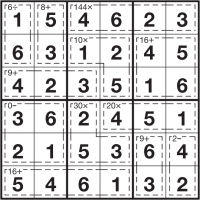 Like Sudoku, you must place each of the numbers 1 to 9 (or 1 to the size of the puzzle) into each of the rows, columns and bold-lined 3x3 (or other size) boxes that make up the grid. You must also place numbers so that each dashed-line cage so that the given total results when the stated operation is applied between all of the numbers in that cage. For example the solution to a "5+" cage requires a set of numbers that add up to 4, such as 1 and 4 or 2 and 3. For subtraction and division you should start with the largest value in the cage and then subtract/divide by the rest, so for example "3-" could be solved with 2,6,1 since 6-2-1 = 3. And what's more, numbers cannot repeat in a cage. So the solution to "8+" can never be 1+1+6, for example. Look at the solved puzzle on the left. In this 6x6 puzzle the top-left cage has a clue of "6÷". This is solved with the values 1 and 6, since 6÷1=6. This is the only possible solution to this cage, although the numbers could have been entered in other order (6 and then 1). Always remember that because you cannot repeat a number within a cage there are often more possibilities than it might appear. For example the 4-square "0-" cage in this puzzle can only be solved by 6,3,2,1 - nothing else is possible. And although it might appear that these puzzles can involve a lot of mathematics, it's rare that you need to do any tricky calculations when solving - they solve mostly via logical deductions similar to regular Sudoku. Every Killer Sudoku Pro puzzle only ever has one possible solution, and it can always be reached via reasonable logical deduction. In other words, guessing is never required. Killer Sudoku Pro puzzles on puzzlemix appear at a wide range of sizes and difficulties but usually they are 6x6, 8x8 or 9x9. In each respective case you must also place 1-6, 1-8 or 1-9 once each into every row, column and bold-lined rectangle. Sometimes Mystery Killer Sudoku Pro puzzles appear on puzzlemix. These puzzles work in exactly the same way except that the +, -, × or ÷ sign is replaced by a question mark, '?'. In this variation you don't know which operation is used - you just know that at least one of the four possibilities will result in the given value. So in other words it could be a +, -, × or ÷ cage but it is up to you to work out which. Very occasionally more than one type of operation will work for a cage, but there is always a unique solution for the numbers that fit in the finished puzzle. Are you searching for help with Killer Sudoku Pro puzzles? Stuck on solving Mathdoku Pro? Don't know the instructions for Sumdoku Pro? Need Addoku Pro instructions? Want solving hints and tips for Killer Sudoku Pro? Then puzzlemix is the place for you to play Killer Sudoku Pro puzzles online. Looking for printed Killer Sudoku Pro puzzles? Visit Sudoku Xtra for puzzle magazines and books. Or are you looking for a Killer Sudoku Pro puzzle supplier? If so then check out Any Puzzle Media, my puzzle production company.